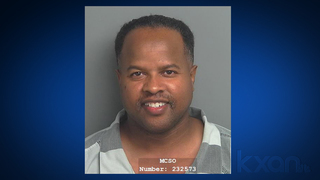 Rep. Ron Reynolds, D-Missouri City, was released from the Montgomery County jail late Thursday night. AUSTIN (KXAN) — A Texas lawmaker was released from a Texas jail at 11:34 p.m.Thursday after serving only four months of a 12-month jail sentence. Rep. Ron Reynolds, a Missouri City Democrat, was convicted of five counts of barratry in 2015 and sentenced to one year in jail. Reynolds won re-election to the Texas House of Representatives in November to represent District 27. He was unopposed in that race, but still managed to gather 47,305 votes. Reynolds was booked into the county jail on Sept. 7 and was supposed to serve a year-long sentence. Reynolds served just shy of four months in jail. Reynolds was a sitting House member when he was convicted in 2015, but spent three years appealing the conviction. Reynolds had his law license suspended on May 2, 2016. Reynolds, a 1999 graduate of the Texas Tech University law school, is still under a suspension by the State Bar of Texas. Since the convictions were misdemeanors, Reynolds did not have to resign from office. Had Reynolds not been released early, he would have missed the entire first year of the 86th legislative session, which reconvenes in Austin next Tuesday.